In early March, Hastings College students discovered clear acrylic cubes containing art that’s no larger than 11 inches placed around campus. The year-long public art initiative, known as the Scintilla Art Box Project, presents small-scale visual art in five buildings. A photo of a Scintilla Art Box in Morrison-Reeves Science Center. Taken in March, the photo shows art created by Lauren Carter. A new art piece is featured in this and the four other boxes each month. The creative pieces are made by emerging artists from across the country and change each month. Themes and guest curators will vary, and there is potential for hosting national calls for entry and additional student involvement. During the summer, the Scintilla Art Box Project will highlight work by Hastings College students. Sarah Swist, assistant professor of Visual Arts, is currently organizing this project. Art boxes are installed in the Fleharty Educational Center, Morrison-Reeves Science Center, Kiewit Building, Wilson Center and the Hazelrigg Student Union. Each includes an artist’s statement and short biography. Swist said she hopes to make additional boxes in the future to expand the reach of the program. After one year, a professional artist from the project will be invited to campus to meet students and give a lecture. The project was made possible by a Hastings College Foundation Board of Trustees Innovation Grant. The clear boxes were made in the Jackson Dinsdale Art Center Fabrication Lab. The first month’s exhibition was titled “Push/Mush/Materiality” because the work was created by five different artists who literally and figuratively pushed materials in unexpected ways. Artist Lauren Carter’s sculpture “Keepsakes” was in Morrison-Reeves, and it featured pieces of her own hair and fingernail clippings inserted in bunny-shaped trinkets. “Hair and fingernails are signifiers of health and beauty, but once they are removed from the context of the living body they become grotesque objects of repulsion,” Carter said. April’s curatorial focus is “Functional Ceramics” and five artists were selected by Christina Erives, a long-term resident at Archie Bray Foundation for Ceramic Arts in Helena, Montana. Each box holds a handmade mug, tumbler or vase. 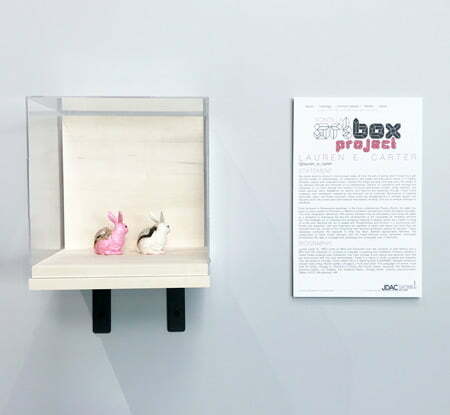 This month, the Scintilla Art Box Project connects with an upcoming functional ceramics exhibition and sale at the Jackson Dinsdale Art Center Gallery. There is a brunch-style reception on Sunday, April 14 from noon to 2:00 p.m.